Qantas is calling on Airbus and Boeing to deliver an aircraft capable of operating nonstop from Australia’s east coast to London and New York within five years. The airline has for some time harboured ambitions of nonstop flights from Sydney to the two cities sitting on the other side of the world that are among Australia’s most popular outbound destinations. And it is now putting down a marker of 2022 to achieve to achieve the so-called “Holy Grail”. Qantas says no aircraft currently in service has the range to fly these direct routes with passengers and luggage at full capacity, while the two most likely candidates currently in development – Boeing’s 777-8X and the Airbus A350-900ULR – “can get close”, it says. “Qantas has issued a challenge to both Airbus and Boeing to extend the range of new aircraft under development and make these non-stop flights possible by 2022,” Qantas said in a statement on Friday. In still air Sydney-London Heathrow is 9,188nm, while Sydney-New York JFK is 8,646nm. Currently, the world’s longest route by distance is Qatar Airways’ Doha-Auckland service at 7,848nm. 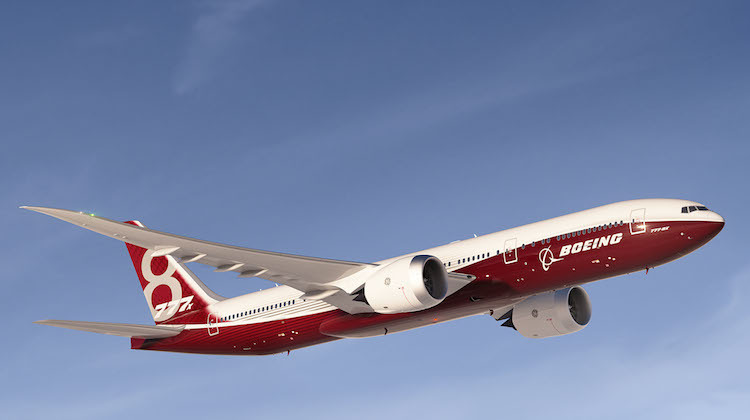 The Boeing website lists the 777-8X as having a range of 8,700nm and a passenger capacity of 350-375 passengers. The aircraft is expected to enter service in the early 2020s. Meanwhile, the A350-900ULR is understood to have a maximum range of 9,700nm, sufficient to operate west-bound Sydney-London flights against prevailing headwinds. Airbus has not published specific technical data on the A350-900ULR. However, a Reuters report in April said aviation experts believed the aircraft would be capable of carrying about 250 passengers on a Sydney-London service. 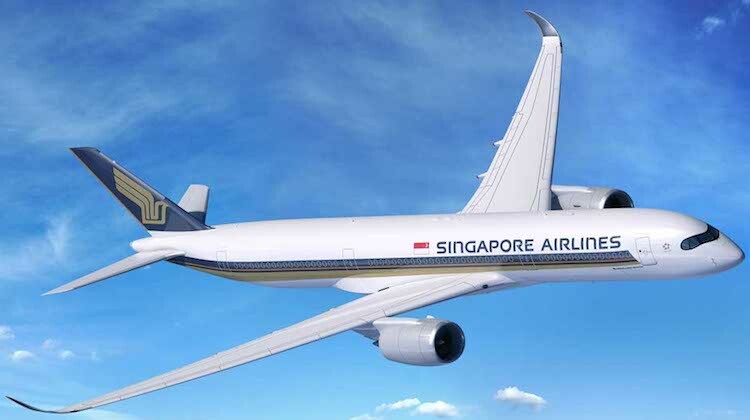 Singapore Airlines (SIA), which is the launch customer for the A350-900ULR, plans to use the aircraft to operate nonstop from Singapore to Los Angeles and New York. It is reported SIA plans to configure the aircraft with about 170 seats. The Star Alliance member and Virgin Australia alliance partner expects to receive its first A350-900ULR in the middle to later part of 2018. It was understood Qantas was seeking an aircraft capable of carrying 300 passengers in both directions on both the New York and London routes. The 777-8X or A350-900ULR would sit alongside the Airbus A380 and Boeing 787-9 in Qantas’s long-haul fleet – with Airbus A330s used internationally mainly on medium-haul services to Asia – as the evergreen 747-400/400ERs are withdrawn. “It’s expected all of Qantas’s 747s will be retired by the early 2020s, roughly in-line with the potential arrival of a new ultra-long range aircraft,” Qantas said. “Hopefully we can fly direct from Sydney to London,” Qantas chief executive Alan Joyce said recently. “We do believe aircraft technology is going to be our friend into the future,” Joyce told reporters at the International Air Transport Association (IATA) annual general meeting in Cancun, Mexico in early June. The extent of the challenge is perhaps best illustrated by Qantas’s Sydney-Dallas/Fort Worth Airbus A380 service, currently the fourth longest route in the world at 7,545nm. The oneworld alliance member, which is starting nonstop flights between Perth and London Heathrow (7,829nm) from March 2017 with Boeing 787-9s, says a nonstop Sydney-London Heathrow offering would cut four hours off the total travel time from the current one-stop routing. Those headed to New York would save three hours off their travel time. The time saved would come from from not having to transit, as well as not having the aircraft slow down prior to landing and the taxiing while on the ground. Qantas said it was conducting wind route analysis as part of a feasibility assessment of the proposed routes. “This involves processing up to 10 years’ worth of real-world weather patterns to run different flightpath scenarios to form a statistical picture of fuel burn (and therefore aircraft range) on the key routes,” Qantas said. Meanwhile, it has established a partnership with the University of Sydney’s Charles Perkins Centre to learn more about the impact of long-haul travel on the passenger experience and better understand how elements such as movement, light, temperature, food and drink affect people before, during and after their flight. We can only hope that once direct Sydney to LHR services commence, Qantas doesn’t forget passengers from Perth, and that they retain at least a daily service from PER. It would also be good if they could commence daily services to Dubai from SYD, MEL, BNE, ADL and PER to enable passengers to connect to the Emirates European and African routes. Come March, Qantas will only offer one daily service to DXB, and that will be from Sydney. It would be good to see Qantas support Qantas passengers, rather than funnel them all to Emirates. Time to build concorde version 2.0 eh ? So great to fly non stop Australia to United Kigdom! This flights will contribute to celebrate century of Qantas the Spirits of Australia. Let continue celebration of Aussie Spirit in aviation. The 777-200LR with a published range of 9370 nautical miles should theoretically fly SYD-LHR, albeit heavily weight restricted. An aircraft that can fly this route exists, but QF for whatever reason chose not to buy it. Holy grail for who? The levels of crew fatigue would be unbearable. There’s no way I’d get on that thing. Per-LHR should be a flight on its own. Can’t comprehend scrapping the A380 from Melbourne and just handing another one to Emirates. QF is calling and I’m sure if QF agreed to buy 100 rather than 6, one of them would build such a plane. Who else but QF is asking for this plane at the moment and the answer is no-one. SQ are happy with the A359ULR and EK the 778. Neither is asking for more. I struggle to see a market for even 25 of these planes globally. You’d think the hurdle for an extension of the existing ULR offerings is around 150 frames depending on how changed they are from their donor aircraft..
One day Qantas will learn the biggest market in the world by a long way is becoming more mature and will need many more flights. Of course I am talking about China. the growing middle class is estimated to be more than 600 million and it grows more each year. Why the fixation with mother England? it represents less and less each year . when around 20 % of the population now comes from an Asian background, you have to wonder why they continually pursue the English market..
maybe it’s a holdover from the seventies going to London thing. have a look how many Qantas flights go to Bali. yes I know about Jetstar , but the biggest travel market for most Australians is totally ignored by Qantas . I was intrigued by Qantas explaining why it has never bought 777’s . they couldn’t make a business case apparently. the rest of the world seems to do pretty well flying into and out of Australia with them. as it was noted here previously by Sam, the 777-200 er could have done the job years ago. apparently Virgin uses half the fuel flying from the east coast Australia to the U.S. versus the 747’s Qantas persists with. ……and yet Virgin Australia still cannot make a profit. What about BNE to LHR . It is about 200 NM shorter than SYD LHR ? Mike 9 London still holds a big pull think of Emirates five A380 flights a day. QF having three with two much smaller than A380 planes is fairly sensible. The issue with China is that QF will grow but most Chinese will still prefer Chinese carriers so QF will expand there at a slower rate as Australians to China is much less than Chinese to Australia. I’m actually surprised Qantas continues to ignore then 777. Would be cheap as chips at the moment and would provide some capacity that the 787 doesn’t. The 787 is a 767 replacement not a 747 replacement. I think that the Jewel in the Crown for Qantas is to provide the fastest freight service in the world between SYD and LHR. Homework has clearly been done to justify the aircraft cost. It would make sense if the A350 could incorporate the largest height (a la future A380 Freight aircraft type) freight modules to avoid any trans-shipping of contents. The passengers and their baggage really are incidental cream on top? If virgin only uses half the fuel with their 777. How come they are still struggling to make any money compared to QF bringing down a billion dollar profit? Jetstar fly loads of service to Bali and as part of the qantas group take control of that leisure market. Qantas flies a token premium leisure flight ex SYD but you can burn QFF points from 8 australian cities direct to Bali with Jetstar. Qantas is there for the premium leisure and business end of the market. Non stop to London would achieve that. Feeders to DXB from major capital cities is a waste of a resource. China is not being ignored with key partnerships with both China Eastern, China Southern, direct Shanghai and Beijing, upgauge in HKG flights(utilising some of the 380s they are pulling of the mother england flight) and Jetstar now going to secondary mainlind markets. Great to see Qantas expansion plans, my holy grail is to travel to Paris from Brisbane however would be happy with Sydney. Living in BNE and wanting to go to Manchester and not LHR I simply choose Emirates. 24 hrs and 5 mins. QF has systematically destroyed the original Kangaroo routes, why this sudden urge to fly them non stop ? Time to build concorde version 2.0, new materials and in flight refuelling. The alternative is nitrous oxide so the passengers can sleep through it but the crew will still be wrecked. How will the airlines deal with fatigue management? So Alan… what IS the airspeed velocity of an unladen swallow? @Alex the biggest problem VA had with JNB wasn’t the aircraft it was the EDTO clearance they had! 773ER is fine, but you need a 240+ clearance to fly it economically. SCL isn’t a problem, NZ fly to South America just fine in a twin. QF’s massive profit was easy when you had a multi billion dollar write down of fleet costs. All accounting tricks. Feeding from Australian capitals is what you’d expect an AUSTRALIAN carrier to do! There is more to Australia than MEL/SYD/BNE you know. QF does actually fly to DPS now ex SYD I think it is. While it may be all well and good that either Boeing or Airbus (or both) may build an aircraft that has the fuel capacity to chug along at 1000klm per hour to New York or London or anywhere else for that matter, it appears that speed does not come into the equation. Passenger aircraft have more or less been travelling at roughly the same speed for almost 50 years and apart from the fling with Concorde that was in essence a rich mans novelty, no development has increased the speed of aircraft. When are we actually going to see a commercial aircraft actually travel at Mach2 or 3 or faster? Maybe we need a Elon Musk to take the duopoly away from Boeing and Airbus that seem to be building aircraft that cram more passengers in them or fly more fuel efficient but cannot fly faster than sub-Mach speeds. I remember reading about the “future” as a kid where the 21st Century was where we would fly from Sydney to London in 4 or 5 hours. All we seem to have succeeded in doing is have aircraft stay up longer due to fuel efficiency or the volume of fuel they carry, but faster? Maybe my grand kids in 2100 will see it because I doubt that I will. Concorde Mk 2??? Yeah, don’t hold your breath. Here is a handful of reasons I don’t see that happening. 1) Drag increases at the square of speed. Ridiculous fuel burn is the penalty of supersonic speed. Today and tomorrow’s fuel prices will quash that idea. 2) Modern day materials? That basically equates to high tech plastic which is fine for making massive weight savings on subsonic transports when the majority of structures are made of the stuff. Supersonic speed will for lack of a better word melt the plane. Remember Concorde used composites in areas not affected by skin friction to save weight, and that was 40 years ago. 3) Sonic boom will upset a few poor people under the flight path, limiting the flights to overwater. And as for inflight refuelling/ nitrous oxide cabin environment, time to get off the bong son. Did not QANTAS do this back in the day with special 747SP, then found no one wanted to do fly it and shut it down? Stephen, there is not need for AJ to rush the cheque book. The next replacement is the 747ERs and that will be in 2022 with a ULR if they can get the right plane at the right price, with the A350ULR being a nose in front. The A330s will follow in 2024 with 787s which may be 78-10s to keep the 300+ seat capacity. The A380 won’t be replaced until 2030 if a mid life upgrade occurs 2019-2020, and by then whats on offer may be very different to whats on offer now. The Rolls Royce Advance Engine will be a game changer by then, and we may see another dozen NEO A380s. in the QF fleet. There’s one major reason ‘end of line’ carriers / countries are keen on this – 6th Freedom traffic rights massacre their markets. If you want to shut-out the Asian and Middle-Eastern interline (IATA 6th Freedom) carriers from routes like the Kangaroo route to the UK or Southern-Cross route to Nth America, then finding a point-to-point solution is the only way. Long way to go stuffed into an uncomfortable metal tube. Sadly can’t see QF providing a seat pitch to make this trip at all bearable. Might be fine in First and Business but the thought of 20 hours stuck in economy is akin to 20 hours of torture. After spending 11+ hours in a you beaut latest bird in cattle class, I certainly will not volunteer to fly any longer. My sanity would not allow it. It’s all good to aim at the hub to hub & anywhere business plans but only if the majority in the back gets 18″ wide & 33″ leg room as a minimum. In my humble opinion the latest trend of 10 abreast is not only tortuous but also plain dangerous. How do they get past the disembarkation test is beyond me. There is no future (or profit) in an airline trying to operate a long haul route with an aircraft that cannot do it year round, in each direction, with a full cargo and passenger load.! Agree completely – circumventing 6th freedom traffic rights and creating ‘terminus’ air routes that are departure to destination (whilst killing off interline carriers) is a huge motivation for carriers like Qantas. It would be very hard for the Asian and Mid-East airlines to get 5th freedom rights (direct Australia to UK/US) when Australia is quite obviously not ‘en-route’ – you only have to look at the reaction to Singapore Airlines’ attempts to get 5th freedom rights direct from Australia to the US. It was squashed very quickly and abruptly. Unlocking direct services to the UK and East Coast US would give Qantas (and any other ‘local’ carriers) a vast protected market, provided pax can be convinced to buy into the time advantage, and put up with the sector duration. I’d fly premium economy, but they charge 100% or so extra for an additional 15% or so of extra space. Something wrong with the maths there somewhere. I think it’s good and both Boeing and Airbus would be jumping on this because it wouldn’t just be Qantas buying the aircraft with the necessary range. I’m sure others would jump on board. How ever speed should be increased and a Concord 2.0 would be awesome and if GE can make their ADVENT engine work and be as fuel efficient as possible and 300+ seating then it might be possible to fly fast with a good pax while being cheap and profitable. Boeing has the technology with its UAV program with NASA and the USAF. Airbus could consider building the originally proposed A350-900R which would have the engines, wings, and landing gears of the -1000. That would bring a range of 8900nm or 10251 miles. That would allow qantas to carry more passengers over that range. It sounds like non-stop long-haul aircraft should be configured for business/1st class customers only to ensure adequate space for comfort, as well as a larger crew and fuel reserves for safety. Economy-class plebs will have to continue ‘suffering’ with longer flights, stop-overs and airline changes as required to get from A to B via C.
The company, Sonic Boom, claim to have resolved the problems of supersonic flight. If so, this would be an ideal aircraft for Australia because we’re in such an isolated global position. Such flights would still only be for premium customers, and only between the largest continental economic centres; e.g. Sydney to Honolulu, LA, Vancouver, New York, Miami, Dallas, Buenos Aires, London, Paris, Berlin, Johannesberg, Dubai, Singapore, Bangkok, Manila, Hong Kong, Shanghai, Beijing, Tokyo. I wonder how Emirates will react to its little tie-up with Qantas, if the ‘Flying Kangaroo’ takes a big leap straight over the top of Dubai with ULR aircraft on the Kangaroo Route. Longer term, the QF-EK link might just have been a shrewd ploy by Joyce & the QF board to make the best of 6th Freedom (sharing the pool of passengers) until such time as these carriers can be locked out of the market – particularly with premium passengers. They may just be positioning the market such that premium (full fare) is non-stop, and leisure (low fare) is one-stop. From what I have read in the company reports as a shareholder, Qantas is break even at best on some of its short haul international flights and loses money on most. . the vast majority of its profits come from domestic routes. it seems to lose money handover fist on its flights to Europe hence the agreement with Emirates. if its such a gold mine to London why do they code share at all? everyone should stop trying to relive the golden days of the 70’s , with QF flights from Sydney. As someone who lives in China part time. it is obvious at Qantas that a market bigger than the US and Europe combined is safe to ignore. “Code share will do” .the Chinese market is rapidly changing from cheap tour groups to upper middle class couples and singles who want a better quality product.. they spend 7 times the amount of any other traveller now, but heh ! lets bring backpackers from Europe . Yes Virgin does lose money but it would lose a whole of a lot more if it was flying 747’s across the Pacific.. The problem for western carriers like QF is that the international passenger in eastern countries in many instances wants to use a local carrier…. so the newly affluent hoards won’t always (if at all) fly QF. QF is wedded to traditional western markets because those passengers will routinely choose a carrier from another country. At best (as we have seen already from QF) are a proliferation of code share services using the aircraft of the Chinese carriers. Hence why western cities are still held with a degree of ‘antiquated’ reverence. And thus direct services that cut out interline carriers are no doubt highly attractive.